Robert E. Herron (Bob) Master Sergeant was born Feb. 18, 1934. Herron joined the U.S. Army on February 13, 1953 and served until February 28, 1994. Bob began his martial arts training in Shoto-Kan karate with Sensei Joe Butrim in April 1968 while stationed in Baltimore, MD. He studied with him for 16 months achieving the rank of 6th Kyu Green Belt prior to being transferred to Buffalo, NY. Unable to locate another Shoto-Kan dojo, Bob began his search for another school. In October of 1969 Bob began training at the World Fighting Arts Isshin Ryu Karate Dojo where he achieved the rank of Shodan by March of 1974. Bob's main Sensei's were John Overton and Quitman Hawkins, however he had numerous Sensei's while training at WFA and was always thankful for all he was taught. His other Sensei's were Bob Zilliox, Jim Gordon, Joe Poligo and Everett Francis. Bob successfully competed in tournaments for 14 years in both the United States and Canada. In 1976 Master Kichiro Shimabuku presented Bob and Instructor's Certificate from Isshin Ryu World Karate Association, Okinawa, Japan. Throughout Bob's martial arts training he has been an avid weight lifter/bodybuilder, training athletes in Power-lifting for the Special Olympics, was the Head Coach of power-lifting for Allegheny County, Pennsylvania and trained men and women in Bodybuilding in YMCAs and Health Fitness Clubs. Bob also assisted the Army by training soldiers, who had failed, to pass the Army Physical Fitness Test, and trained injured soldiers in rehabilitative weight training programs. 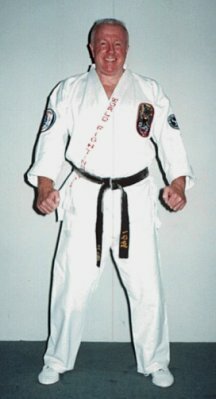 In October of 1985, Sensei Herron was transferred to Fort McPherson, Georgia where he continued training and teaching under Senseis John Overton and Quitman Hawkins. In 1990 Grand Master Angi Uezu presented Bob an Instructor's Certificate from the Okinawa Isshin Ryu Karate and Kobudo Association, Okinawa, Japan. While stationed in Georgia, Bob and Dai Sensei John Overton maintained contact with each other by visiting each other at least once a year until Dai Sensei Overton death in November 1991. Dai Sensei Bob Herron became the Head Instructor and a direct student of Grand Master Angi Uezu, Okinawa, Japan. Bob has maintained contact with Grand Master Uezu and has traveled to Okinawa both in November of 1996 and October of 2000 to visit and train with Grand Master Angi Uezu. Grand Master Uezu visited Sensei Herron at his home and dojo in 1996.